We often prefer the simplest solution for better quality control. In this aspect, precast concrete (PC) offers one of the most straightforward and speedy methods for the construction of multi-story buildings that require minimal maintenance. In high seismic regions such as California, seismic risk issues are always raised, and PC structures should demonstrate their ability to provide structural integrity between the connected precast members under maximum credible earthquake. Lateral load resistance of precast concrete (PC) walls is achieved by emulating cast-in-place detailing, by the use of grout sleeve splices for longitudinal reinforcement, by adopting the post-tensioning technique, and/or by mechanical connection with the roof and floor diaphragms. An innovative steel plate connector system developed by Seoul National University’s research team in Korea for connection between precast concrete (PC) wall panels or to foundation may not need any of the above methods. 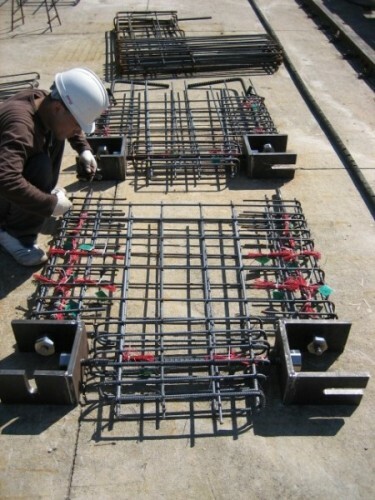 Even the non-shrink grout, which is necessary when applying the post-tensioning or re-bar splicing technique, is not needed for this steel plate connector system (though you can apply the grout after bolting for fire and corrosion protection and to fill the gap). Such a connector system is expected to enhance constructability and lateral load resistance, and is perfect for fast-track low-rise buildings such as tilt-up construction in low to high seismic areas. The system consists of two bolt type C-shaped connectors, end-threaded reinforcing bars, hexagonal nuts and washers/shims. Details of the bolt type connectors are shown in Figs. 1 to 3. “Two pieces of the C-shaped connectors with horizontal and vertical slots would provide a great tolerance for construction variations,” said Sung-Gul Hong, a professor of Seoul National University. “Even though this system has never been applied in the real world, we believe that the developed system would increase construction efficiency enormously without sacrificing its lateral load resistance capability,” said Hong. The C-shaped connectors are intended to transfer tension and compression forces in the main flexural reinforcement and/or concrete. The maximum stress concentration is at the interface between two steel plates as the force path changes direction. The details at this critical location might be something to be fine-tuned before its application. The hollow part at the end of the wall is essential for easy assembly of PC panels by bolting. There are two options here: each panel element can be pre-tensioned, or the panels can be produced without a prestressing process.